Exceptional and exceptionally rare circa 1715 rectangular form table having original silvered (white gold leaf) gesso finish with incised top having central spread-winged eagle on cloud surrounded by punchwork, foliate, and strapwork motifs surmounting acanthus motif frieze above decorated apron joining cabriole legs with acanthus motifs ending on four pointed acanthus motif 'Spanish' feet. 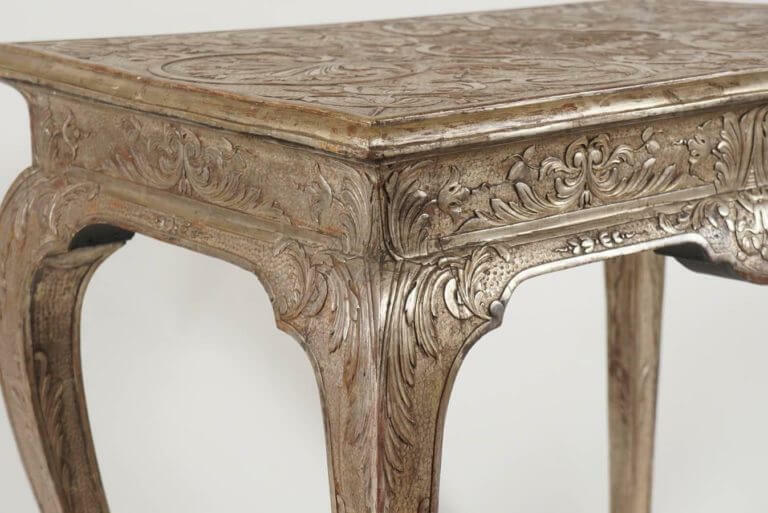 Though unmarked, as is typical, this table is firmly attributed to the workshop of James Moore. 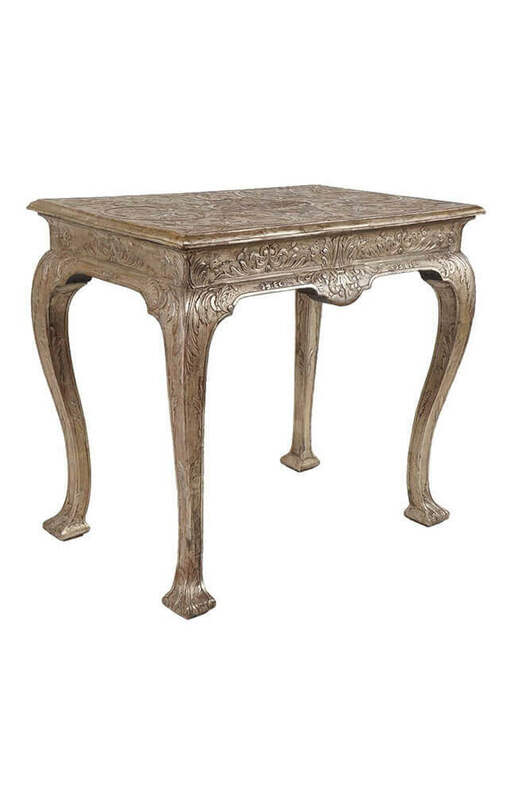 When first constructed, the table would have appeared to be of solid silver, illustrating the wealth of the owner. 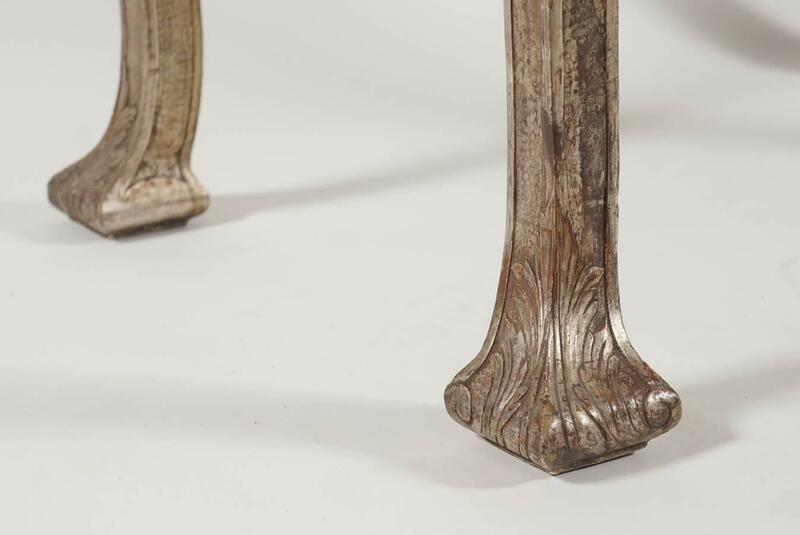 Silvered gesso furniture of the Queen Anne and George I periods is extremely rare as what is typically found is yellow gold gilded, see below. Early 20th-century metal museum or private collection tag affixed to underside. 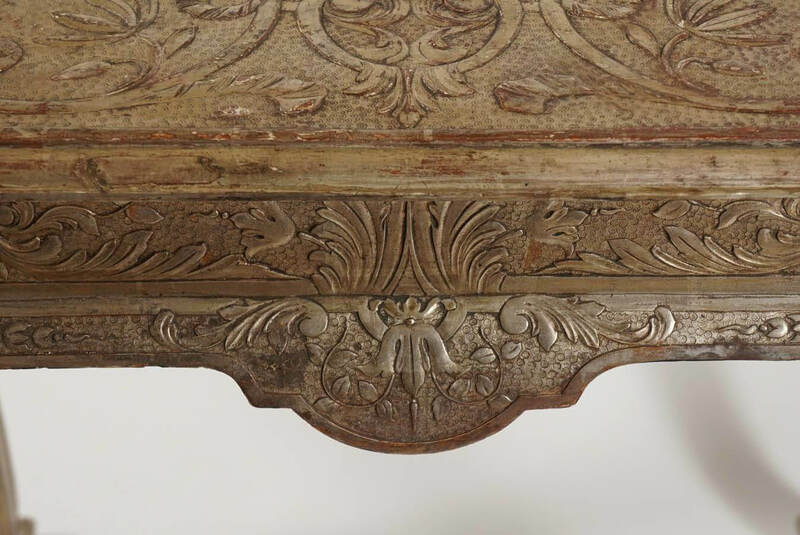 Biography & Literature: "James Moore (c. 1670 - 1726) was one of the leading furniture makers in London during the first quarter of the 18th century. 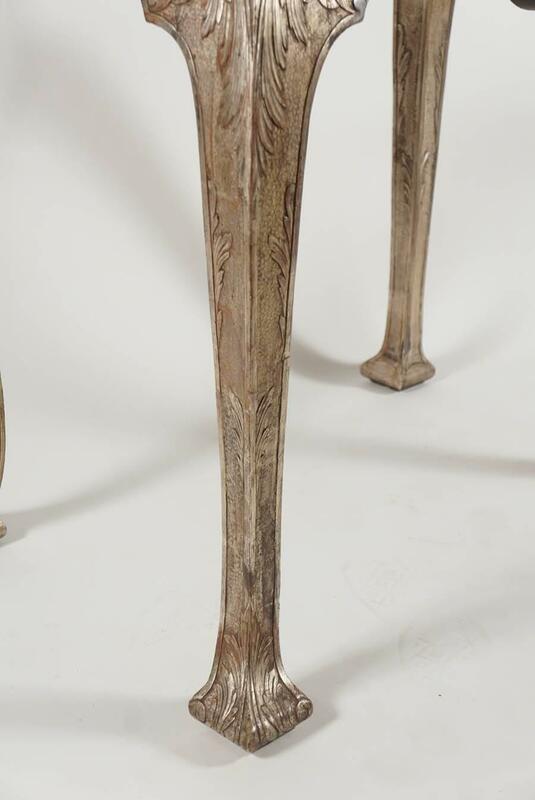 He seems initially to have worked closely with John Gumley, but by 1712 had established his own workshop at Nottingham Court, Short's Gardens, in the parish of St. Giles-in-the-Fields. Benjamin Goodison became one of his journeymen, and his son James Moore (d. 1734) carried on the business. 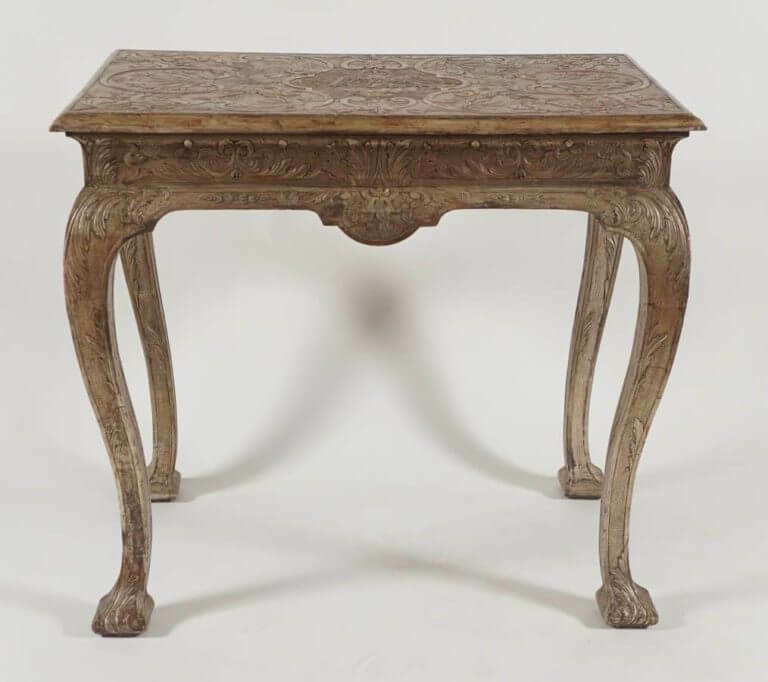 The firm was involved in furnishing Blenheim Palace, Burlington House, Dalkeith Palace and probably Boughton, although the only provenanced furniture incised 'MOORE' is in the Royal collection." - C. Gilbert, Pictorial Dictionary of Marked London Furniture, 1700-1840, Leeds, 1996, page 41. 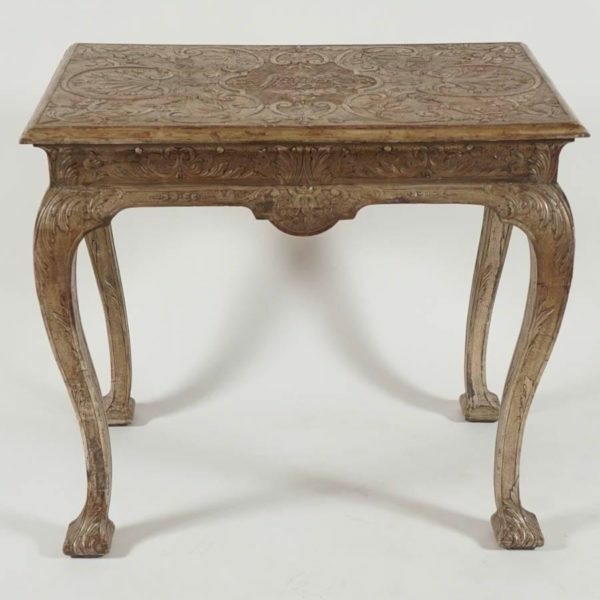 A very similar pair of tables to the one on offer is illustrated on page 562 in "The Connoisseur's Complete Period Guides to the Houses, Decoration, Furnishing and Chattels of the Classic Periods" by Ralph Edwards and L.G.G. Ramsey, Bonanza Books, New York, 1968. The tables illustrated and referenced are described as "highly exceptional because they are silvered and not gilded, there being very little silvered gesso furniture extant."